Photo taken today from a double-decker bus. This walled enclosure appeared to contain a great number of CWGC headstones. This cemetery is known by two names; Newington Cemetery or Echo Bank Cemetery. I shall continue calling it Newington Cemetery as I have never heard of anyone from Edinburgh call it Echo Bank. 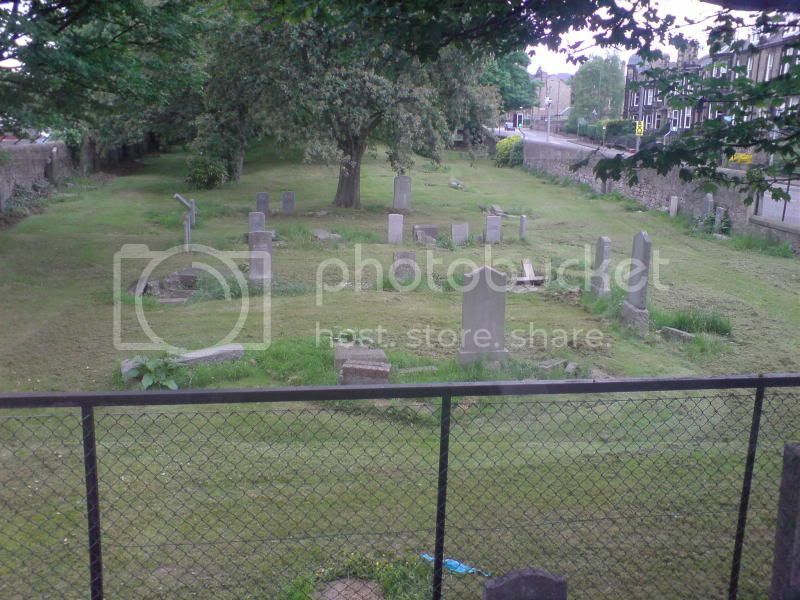 This burial ground suffers from the same lack of attention as Warriston Cemetery. Part of it is trimmed and just kept from the ravages of Mother Nature. The other part not seen from the road is wild and overgrown. An example of one area is shown below. 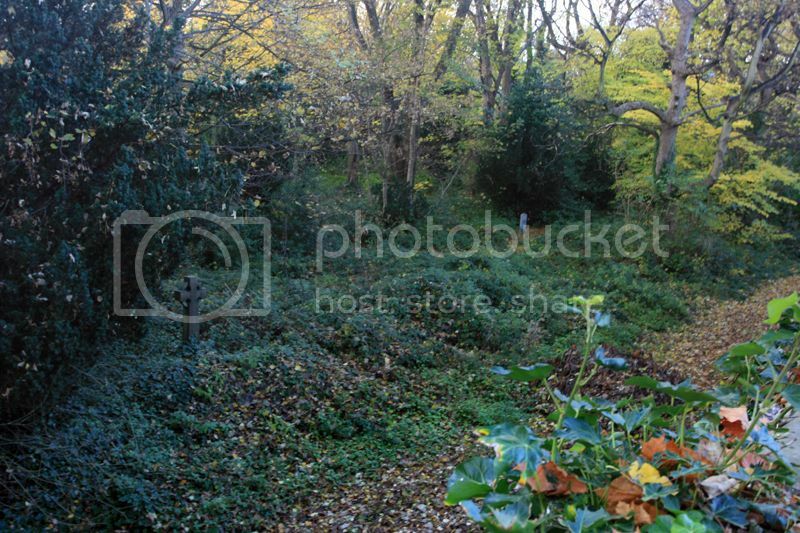 There may be some headstones in amongst this jungle as you can see one CWG headstone in the photo and I came across another two in a similar situation. Entry to the cemetery is from Dalkeith Road, between the Commonwealth Pool and the Cameron Toll Roundabout on the right hand side. An area just to the left as you enter the cemetery has been set aside for burials of those of the Jewish faith. It seems that this is no longer used, but I could be wrong. One interesting find here is Private L. Rupesinghe of the Ceylon Medical Corps. 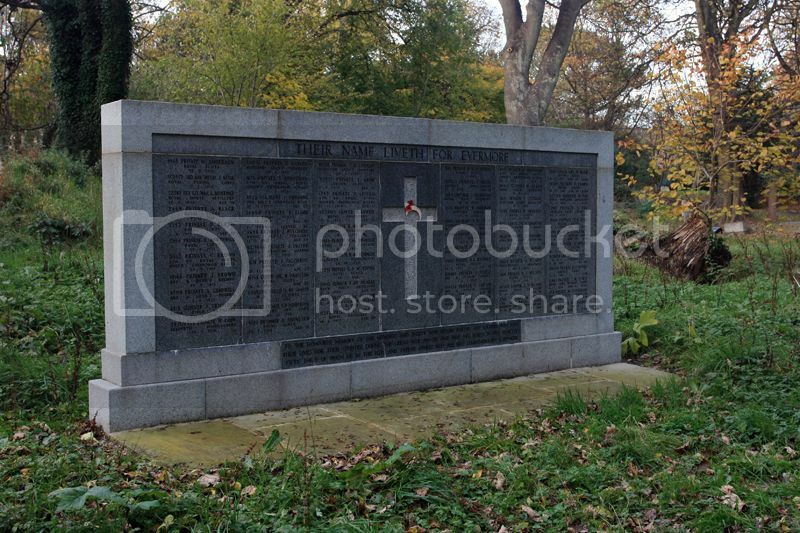 Edinburgh (Newington or Echo Bank) Cemetery contains 142 scattered burials of the First World War and 14 from the Second World War. 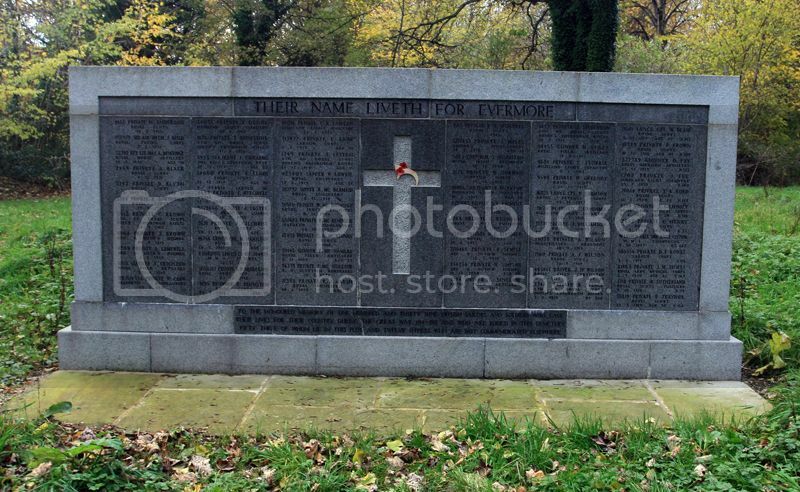 Those of the 1914-1918 war whose graves are not marked by headstones are named on a Screen Wall memorial erected in the main War Plot (Section A1). Regiment/Service: Royal Scots 3rd/6th Bn. Additional Information: Born in Edinburgh; Died at home. Additional Information: Born in Leith. Unit: attd. Edinburgh University O.T.C. Additional Information: Son of William and Hannah Beveridge; Husband of Fanny Beveridge of Yew Tree House, Lower Frankton, Oswestry, Salop. Born in Liverpool. Additional Information: Son of Jacob and Annie Blyth; Husband of Ellen Blyth of 68 Bristo Street, Edinburgh; Born in Dalkeith, Midlothian. Additional Information: See "PURVIS," the true family name. Additional Information: (Served as BROWN). Unit: 6th Div. Ammunition Col.
Additional Information: Son of James and Mary Edwards; Husband of Elizabeth Price (formerly Edwards) of Greenall's Cottages, Ditton, Widnes, Lancs. 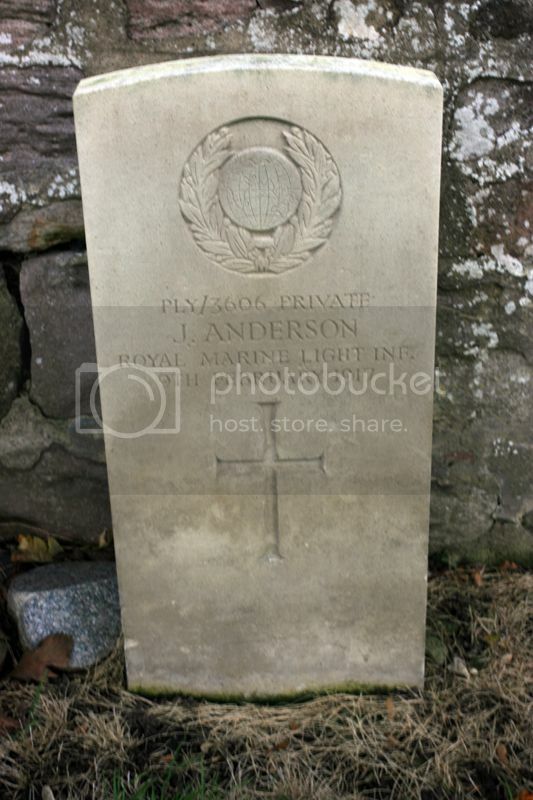 Additional Information: Son of David and Jane Anderson Elgin of 79 Pleasance, Edinburgh. Additional Information: See "FERRIE," the true family name. Additional Information: Son of James Ferrie of 22 Noper Street, Penicuik, Midlothian. Additional Information: Born in Morecambe, Lancs; Resided in Leeds, Yorkshire. Additional Information: Son of the late George and Margaret Gilchrist; Born in Edinburgh. Additional Information: Son of Fred and Hannah Hamilton of 230 North Woodside Road, Glasgow; Born in Edinburgh. Additional Information: Died from illness (probably Spanish flu). Additional Information: Son of William and Margaret Lindsay Johnston of 37 New Street, Edinburgh; Husband of Marion Johnston of 104 Nicolson Street, Edinburgh. Additional Information:Son of Robert and Mary Laidlaw of High Street, Lauder, Berwickshire. Unit: 322nd Home Service Works Coy. Additional Information: Son of Sarah Ann Lamb and the late William Lamb of 15 Elgin Street, Sunderland; Born in Sunderland. Additional Information: Son of John and Helen Leitch of 1 Oakfield Court, Pleasance, Edinburgh; Born in Kirkliston, West Lothian. Additional Information: Husband of Helen Lowrie of 62 Causewayside, Edinburgh. Additional Information: Son of George McNamara of 90 Corporation Place, Dublin. Additional Information: Son of Mrs. Matilda Myles of 5 Richmond Court, Edinburgh. Additional Information: King George's Durbar Medal; Son of the late Serjt. Bglr. Alexander Paton (1st Bn. H.L.I.) and Jessie White Paton of 16 Beaumont Place, Edinburgh. Additional Information: Son of Mrs Mary Ann Rinsdale of 35 Factory Street, Barton Hill, Bristol. Additional Information: Son of the late Matthew and Mary Simpson; Husband of the late Mary Jane Farrell Simpson. Additional Information: Son of Tom and Ellen Stevenson; Husband of Janet B. Stevenson of 59 Bristo Street, Edinburgh. Additional Information: Son of Thomas and Margaret Williamson of 3 Beggs Buildings, Abbeyhill, Edinburgh. Additional Information: Son of Mrs. Margaret G. Wilson of 30 Arthur Street, Edinburgh. Unit: 51st Div. Ammunition Col.
Additional Information: Husband of Jessie Wilson of 1 East Adam Street, Edinburgh. Additional Information: Son of John and Martha Blair; Born in Paisley; Served in the South African Campaign. Additional Information: Son of James and Elizabeth Brown of Barony, Glasgow; Husband of Euphemia Mathieson Brown of 65 Lauriston Street, Edinburgh. Additional Information: Son of James and Catherine Ford of 493 Lawnmarket, Edinburgh. Additional Information: Son of the late Stephen and Margaret Gilhooly of Edinburgh. Additional Information: Husband of Isabella Campbell Henry of 42 Sciennes, Edinburgh. Unit: No 4 Field Amb. Additional Information: Husband of Annie Shiels of 13 Arthur Street, Edinburgh; Born in Edinburgh. Additional Information: Husband of Catherine Traynor of 19 Salisbury Street, Edinburgh. 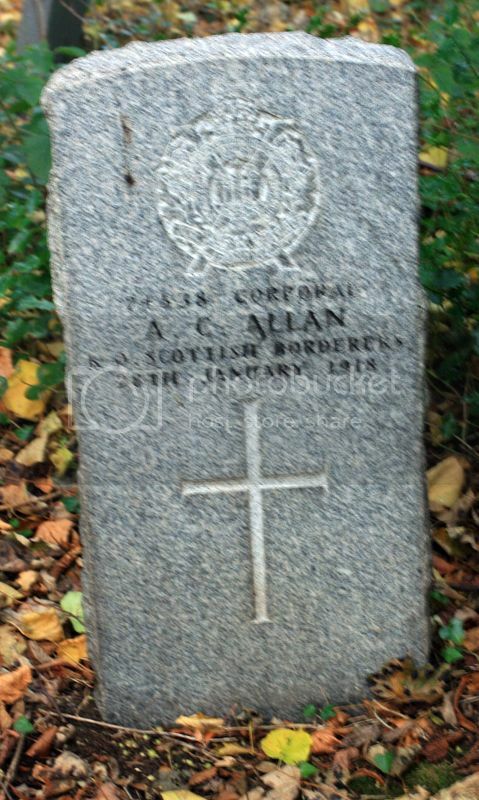 There seems to be a conflict here between the CWG site and the SNWM site regarding Service No details for the last regiment this person was a member and also his place of birth. I shall be contacting both sites to try to resolve this issue. Additional Information: Son of William and Georgina Abercrombie; Husband of Agnes Abercrombie of Eildon Terrace, Melrose; Born in Edinburgh. Other detail Inland Water Transport, formerly 37290, Scot. Rif. Other detail latterly WR/352167 Inland Water Transport, R.E. 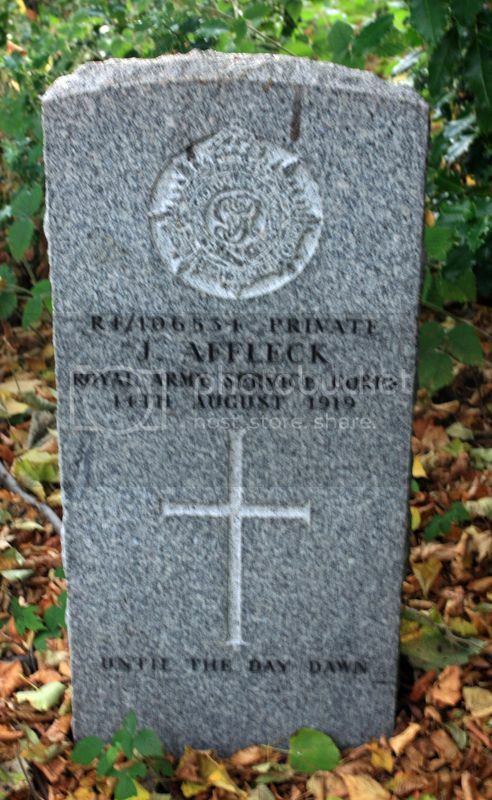 Additional Information: Husband of Janet T. Affleck of 34 Carnegie Street, Edinburgh. Additional Information: Son of William and Helen Morrison Petrie Alexander of "St. John", Burgess Terrace, Edinburgh. 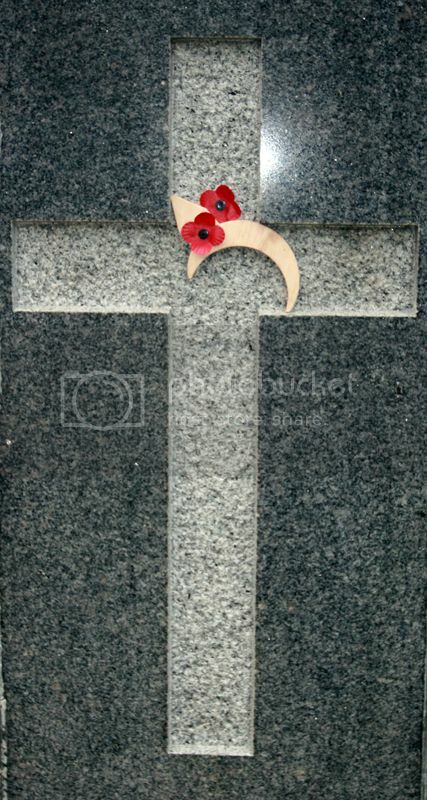 Additional Information: China Medal 1900; Served on HMS Dolphin 13/11/15 - 28/08/16; Discharged Invalided 27/10/16; Died after Discharge (Invalided).